Biography of Richard Dobbs Spaight, Sr.
Spaight was born at New Bern, NC, of distinguished English-Irish parentage in 1758. When he was orphaned at 8 years of age, his guardians sent him to Ireland, where he obtained an excellent education. He apparently graduated from Scotland's Glasgow University before he returned to North Carolina in 1778. At that time, the War for Independence was in full swing, and Spaight's superior attainments soon gained him a commission. He became an aide to the state militia commander and in 1780 took part in the Battle of Camden, SC. The year before, he had been elected to the lower house of the legislature. 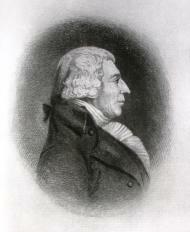 In 1781, Spaight left the military service to devote full time to his legislative duties. He represented New Bern and Craven County (1781-83 and 1785-87); in 1785, he became speaker. Between terms, he also served in the Continental Congress (1783-85). In 1787, at the age of 29, Spaight joined the North Carolina delegation to the Philadelphia convention. He was not a leader but spoke on several occasions and numbered among those who attended every session. After the convention, he worked in his home state for acceptance of the Constitution. Spaight met defeat in bids for the governorship in 1787 and the U.S. Senate 2 years later. From then until 1792, illness forced his retirement from public life, during which time he visited the West Indies, but he captured the governorship in the latter year (1792-95). In 1793, he served as presidential elector. Two years later, he wed Mary Leach, who bore three children. In 1798, Spaight entered the U.S. House of Representatives as a Democratic-Republican and remained in office until 1801. During this time, he advocated repeal of the Alien and Sedition Acts and voted for Jefferson in the contested election of 1800. The next year, Spaight was voted into the lower house of the North Carolina legislature; the following year, to the upper. Only 44 years old in 1802, Spaight was struck down in a duel at New Bern with a political rival, Federalist John Stanly; so ended the promising career of one of the state's foremost leaders. He was buried in the family sepulcher at Clermont estate, near New Bern. Thrilling re-enactments of great battles, compelling period images, rare archival material, and commentary by leading historians bring the past vividly alive. Between Bunker Hill and Yorktown, from Ben Franklin's masterful diplomacy to Benedict Arnold's deceit and tragedy, The American Revolution presents a sweeping canvas of historical programming at its comprehensive best. It was a revolution of the mind, in which the concept of equality, democracy, and private interest grasped by hundreds of thousands of Americans transformed a country nearly overnight. Exciting, compelling, and sure to provoke controversy, the book will be discussed for years to come.